PROVIDENCE, R.I. - The No. 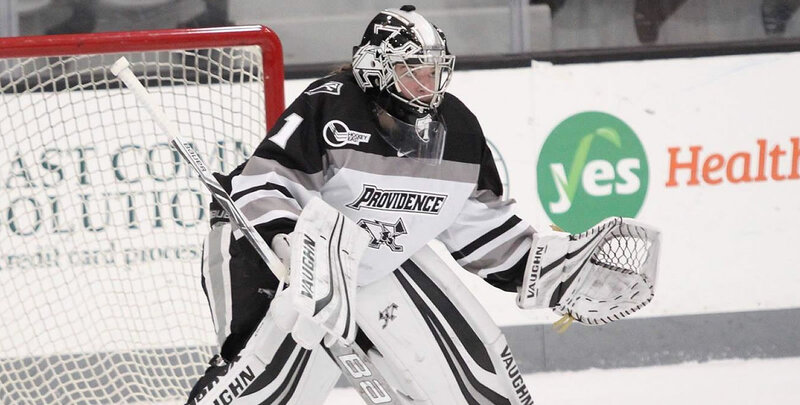 9 Providence College women's hockey team shutout the University of New Hampshire Wildcats for the second time this season with a 4-0 victory at Schneider Arena on Jan. 18. - The game was locked at 0-0 following the first period. Madison Myers (Colchester, Vt.) stopped all 13 shots the Wildcats put on net. Krya Smith made 12 saves for UNH at the other end. - The Friars opened the second period by killing off 36 seconds of a carryover penalty. Kate Friesen (Altona, Manitoba) was sent to the box shortly after, forcing the Friars onto another kill. UNH went 0-for-3 on power play opportunities early in the contest. - Just after Friesen's penalty expired, Annelise Rice (Excelsior, Minn.) corralled a rebound off the boards in the defensive end. Her and Hayley Lunny (Bedford, N.Y.) skated in on a 2-on-1. Rice played it into the slot for Lunny, who roofed a shot over Smith's glove. - The goal was Lunny's sixth of the season and came 3:22 into the second. Rice's assist was also her sixth of the season. - Providence finally had some power play chances of its own in the third. While unable to convert on the first chance, which came just four seconds into the period, the Friars capitalized on the second. - Avery Fransoo (North Battleford, Saskatchewan) played it across the blue line to Sara Hjalmarsson (Bankeryd, Sweden). She played a slap pass toward goal, where Whitney Dove (Port Moody, British Columbia) tipped it through Smith's five-hole. - Dove's goal was her fifth of the season. Hjalmarsson's assist was her ninth, while Fransoo's was her 11th. - Friesen extended the lead, scoring her fifth goal of the year with less than five minutes to play in the game. Lunny skated hard to the puck, curled and passed it in front for Friesen to knock in from the top of the crease. - Lunny added an empty-netter with 1:03 remaining to give her a career-high three-point game. Rice assisted the play, allowing her to tie her career-high in assists (two) and points (two). - Myers finished with 29 total saves in her fourth shutout of the season. Smith made 28 for UNH. - Providence went 5-for-5 on the penalty kill, while going 1-for-2 on the power play. - The Friars are now 2-0-0 this season against the Wildcats. Both games have been shutouts for Providence. Providence faces New Hampshire again tomorrow (Jan. 19) at 3:00 p.m. at Schneider Arena.